A few months ago, Jolie Roberson blew into town from Chicago and turned my dance life upside down! There I was, wanting to branch out from ITS and hone my solo skills, and also wishing that I could take a drills class to really perfect some basics. There she was, ready to make me regret my wish by making me layer half-boxes over a tick-tock shimmy. Jolie's classes are the perfect thing for the dancer who wants to be challenged. They start with a muscle-building warm-up (which usually involves crunches, push-ups, and other forms of torture... I mean exercise) and then move on to the dancing! The focus is on tribal fusion, with elements of ballet and modern dance. The Choreo class usually focuses on some aspect of dance within the choreography -- whether it's expressing certain emotions, or traveling, or directing movement with your arms, there's almost always some central lesson to take away and apply to other dances. 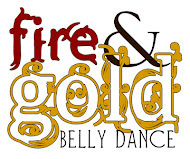 Bellydance 101 tricks you with its name, making you think it will be easy. It is not. The moves may be basic, but Jolie focuses on training you to do them muscularly, with control, at various speeds, and layered over things that you don't think they should be layered over. Sometimes she comes up with layering ideas that even she struggles with, and we all get to be frustrated together. Drills and Technique is like a more advanced version of 101, with more layers and doing things for longer. One night we had to spend two entire songs layering belly rolls over vibration shimmies. It's a great class for discovering what your strengths and weaknesses are then working on how to improve them. Jolie teaches a couple of other classes that I haven't taken yet, and has more classes coming up on her schedule in February. She's also available for private lessons. For more information, you should visit her website Skirt Full of Fire.